The 3-Way Actuator is used to automate the switching of a 3-way valve on the greywater plumbing system. The 3-way Diverter Valve used for greywater systems is manually controlled by turning the handle on top of the valve. In some situations the 3-way valve may need to be installed in inaccessible location, or the user does not want to have to go outside/under the house to switch the valve. 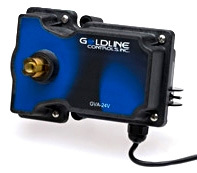 The 3-way valve actuator can be mounted on top of the 3-way valve and connected to a switch installed inside the building to control the valve. The actuator is wired to a plug in 24 volt transformer. Our 3-Way Valve Actuator Switch Kit includes all the items needed to automate the switch of a 3-way valve.